Past Thursday was my fourth time guest lecturing for Tom’s Cognitive Science course. I owe Tom and the students a big thank you. I had a great time presenting, and hope I was able to share some of my enthusiasm for evolutionary games. What is kin selection? What is green-beard effect or ethnocentrism? How do you think kin selection could be related to the green-beard effect or ethnocentrism? What does Wright say compassion is from a biological point of view? Do you think this is a reasonable definition? Can a rational agent be compassionate? Is understanding the indirect benefits (to yourself or your genes) that your actions produce essential for compassion? What simplifying assumptions does evolutionary game theory make when modeling agents? Are these assumptions reasonable? Can compassion or cooperation evolve in an inviscid environment? What about a spatially structured one? What is reciprocal altruism, direct reciprocity and indirect reciprocity? What is a zero-sum game? Does a non-zero-sum relationship guarantee that compassion will emerge? 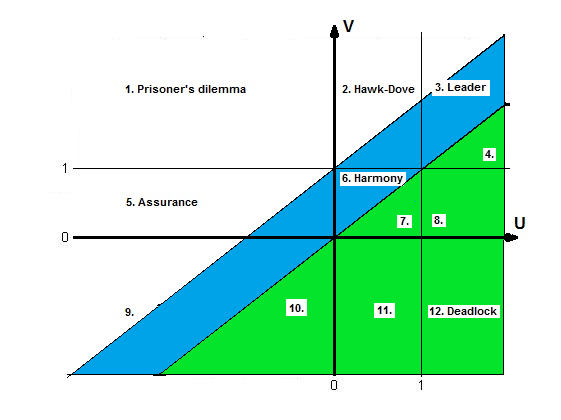 Is the Prisoner’s dilemma a zero-sum game? Can you have a competitive environment that is non-zero sum? During the lecture, we would pause to discuss these questions. As always, the class was enthusiastic and shared many unique viewpoints on the topics. Unfortunately, I did not sufficiently reduce the material from last year and with the discussion we ran out of time. This means that we did not get to the ethnocentrism section of the slides. For students that want to understand that section, I recommend: Evolution of ethnocentrism in the Hammond and Axelrod model. To the students: thank you for being a great audience and I encourage you to continue discussing the questions above in the comments of this post.